Months of Inventory (MOI), for apartments (1.38 months) and attached homes (1.35 months) has not been as low as this February at any point in the past decade. I have not had the time to go into statistics prior to 2006 but it may well be that MOI for apartments and attached homes have never been this low before! Detached homes are also at historic, though not record, lows and were at 2.47 in February. 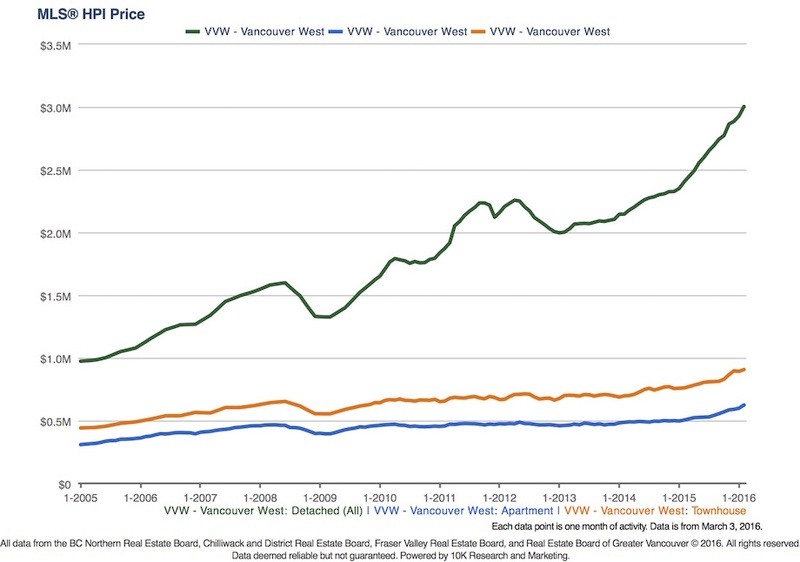 The Real Estate Board of Greater Vancouver's HPI Index had record pricing yet again for all Westside home types. 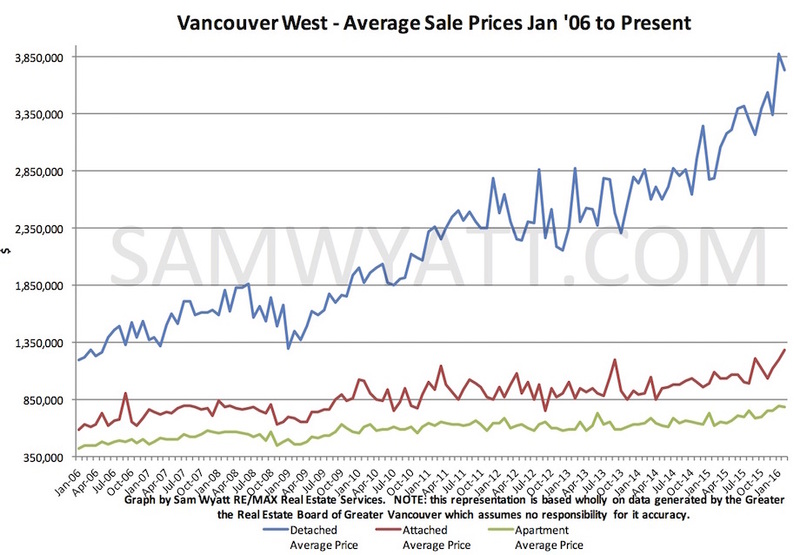 Notably, a "typical" Westside detached home is now over $3,000,000! The average sale price for a detached home was over $3.7m in February. Although there have been significant pricing increases for all home types, the spread on median prices per square foot between home types continues to widen. The difference between a detached and attached home in February was nearly $350/sq.ft!!! It is a great time to downsize or to take some profits from rental properties. 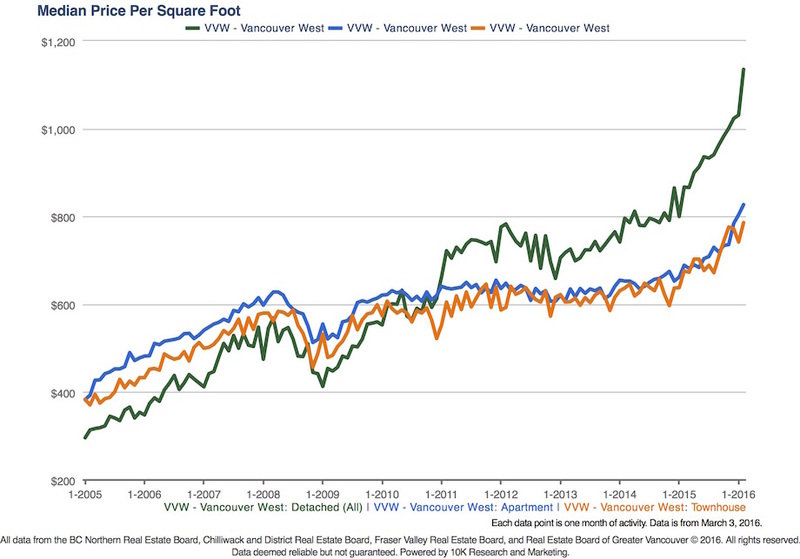 The difference in median price for a 2500 sq.ft. house and a 2500sq.ft townhome is over $870,000. Why is the market so hot? Lack of active listings is the answer. 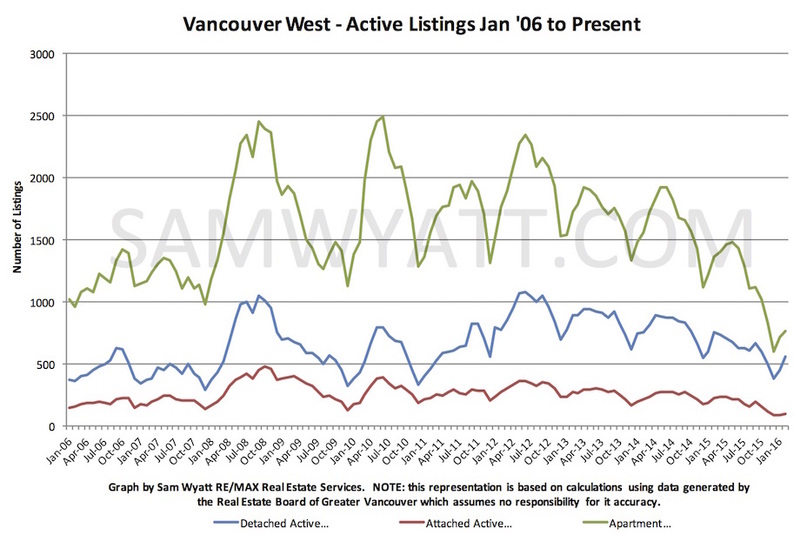 Mirroring MOI, apartments and attached homes had the lowest active listing volumes in the past decade. 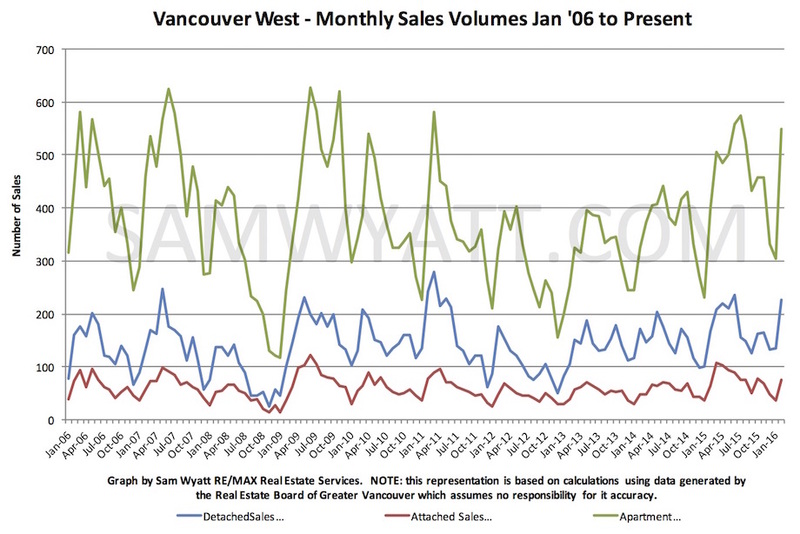 Sales volumes are high as well - can the frantic situation continue? 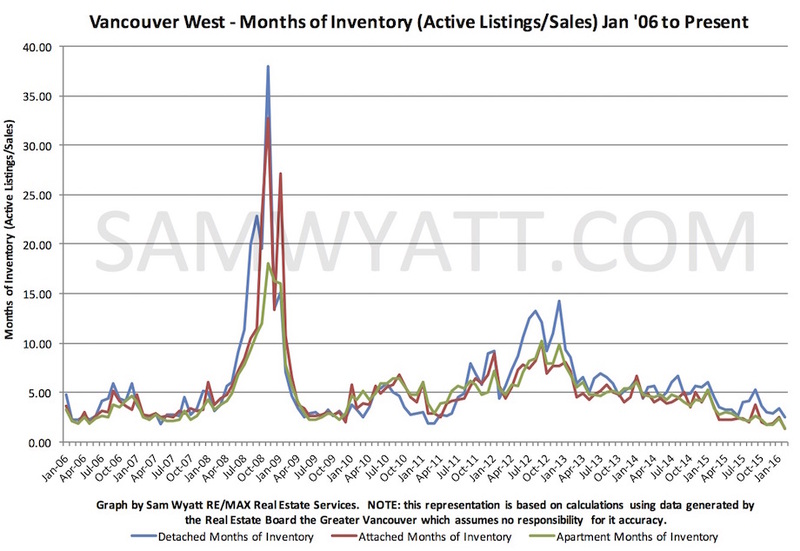 *Remember that Months of Inventory (MOI) is a measure derived from the number of active listings during a given month divided by the number of sales that month. It indicates the theoretical length of time it would take to sell all of the properties on the market if nothing changed. Historically, 0-5 months of inventory has generally implied upward price pressure for the ensuing six months, 5-8 months of inventory meant a flat market with respect to pricing and over 8 months of inventory has, for the most part, precipitated downward price pressure. Do not hesitate to call me if you have any questions. Please pass this and my contact information along to any friends or family who might benefit from my services. FortBlanc by Ubertor © 2018 All Rights Reserved.